The biggest problem with Justice League United's crossover with The Legion of Superheroes is that it is a Legion of Superheroes crossover. The good news is that thanks to The New 52, readers will not have to worry about any of the cumbersome continuity problems that beset the classic LOSH comics. 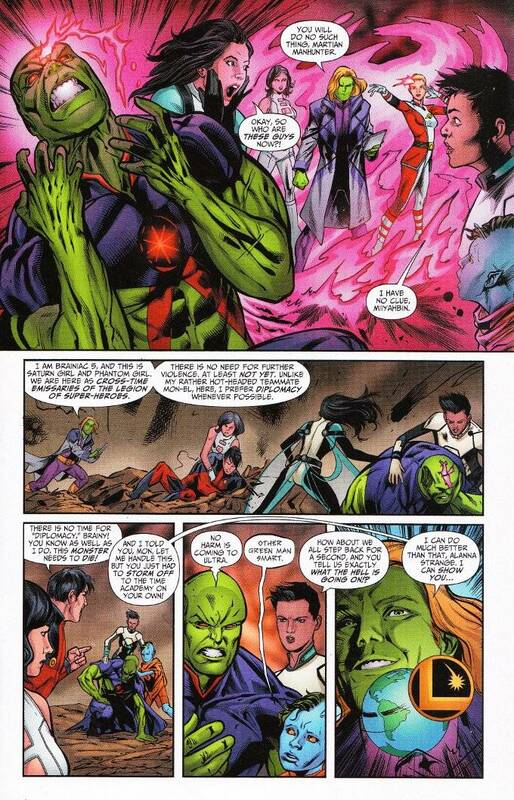 The bad news is that the LOSH are still a collective of bland characters largely defined by their individual super-powers, with only Brainiac Five and Mon-El possessing any kind of personality. And those personalities are "know-it-all jerk" and "hot-headed douche-bag" respectively. Writer Jef Lemire does what he can, but even he can't battle the inherent inertia of an storyline involving The Legion of Superheroes. Too much time has to be devoted to explaining who they are and listing off the individual members of the team. It also doesn't help the plot is strictly standard, with The Legion having come back in time to kill Ultra (Jonn J'onzz's adopted multi-ethnic alien son) before he becomes a world-destroying monster known as Infinitus in the future. The subplot involving the rest of The Justice League trying to track down the body of a deceased Hawkman is far more interesting for a number of reasons. Chief among these are the interplay between the team members and the little character touches that Lemire excels at. 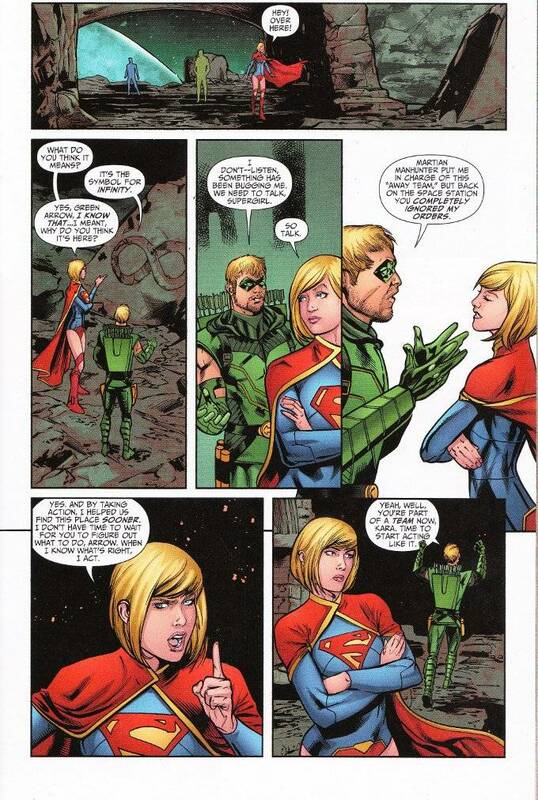 My personal favorite was the interplay between Supergirl and Green Arrow, with the inherently rebellious Oliver Queen struggling in a position of authority as he tries to reign in the equally rebellious Supergirl. The artwork this time is a bit of a mixed bag. Neil Edwards is a skillful penciler and there are a number of Kirbyesque splash pages throughout the book. The problem is that many of the poses of Edwards' figures seem overly forced and artificial, up to and including two women pointing their posteriors directly at the reader while curving their backs so we can see the profile of their chests! The inks by Jay Leisten are competent but not particularly noteworthy. The best aspect of the artwork is the coloring, with Jeromy Cox using a vibrant, heroic palette that makes everything jump off the page in just the right way.